The Samsung has launched two new budget devices in Indian recently under its latest M series. We pitted the Galaxy M10 against the RealMe affordable device C1 to see which one would be the right choice for you under a limited budget? After teasing for a long period of time, Samsung has finally launched its Galaxy M10 and M20 in India in January. Both the devices are priced under Rs 15,000 and sports a dual camera setup on the back. 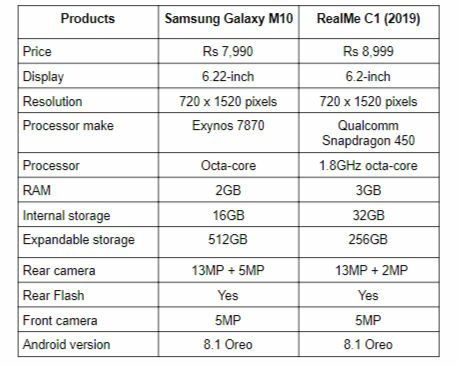 We are comparing the Samsung Galaxy M10 with the RealMe budget device C1 that also comes around the same price. So, let’s begin with a quick specs comparison of the two to know which device is better when it comes to hardware at least on paper. The Samsung Galaxy M10 sports an HD+ 6.22-inch display that offers a resolution of 720 x 1520 pixels. The RealMe C1 also comes with a 6.2-inch screen that offers a resolution of 720 x 1520 pixels. When it comes to the processor, the Samsung Galaxy M10 is powered by an Exynos 7870 octa-core processor, which is coupled with 2GB RAM and 16GB internal memory. On the other hand, the RealMe C1 is backed by a Qualcomm Snapdragon 450 octa-core processor that is paired with 3GB RAM and 32GB internal memory. Coming to the cameras, the Samsung Galaxy M10 has a dual camera setup on the back comprising of a 13MP primary camera accompanied by a 5MP ultra-wide lens. The RealMe C1 also has a dual 13MP + 2MP camera setup on the back. At the front, both the devices are equipped with a 5MP shooter. 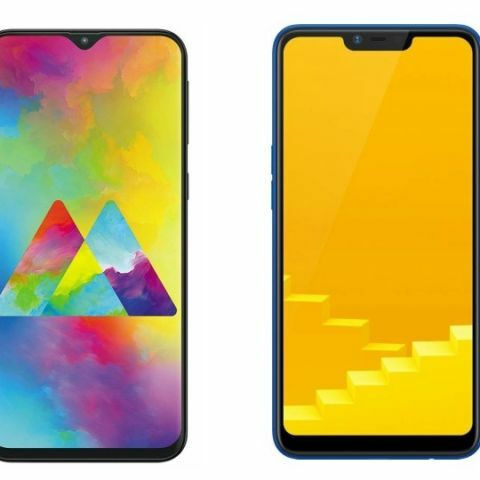 The Samsung Galaxy M10 is priced at Rs 7,990 in India, while the RealMe C1 is available on Flipkart for Rs 8,999.